Why Give Through West Marin Fund? 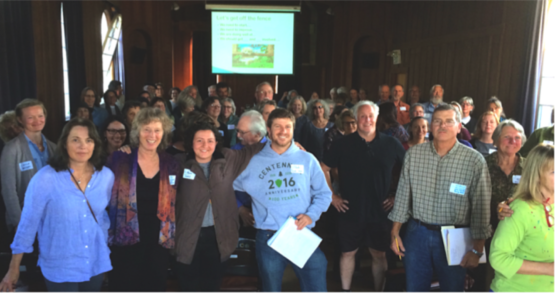 West Marin Fund convened our 10th ConFab on September 13, 2016, this one on Fundraising and Legacy Giving Programs, offered by the inimitable and popular expert Kim Klein. Her style is informative and entertaining – and a roomful of local leaders went away better fundraisers because of it. Kim’s book Fundraising for Social Change, now in its 7th edition, is the bible for many in this field. this free skill-building workshop, a new record! Building Nonprofits Capabilities: This ConFab and others respond to the critical need to upgrade fundraising capacities of nonprofits. It’s hard work, and not always comfortable for board members or staff to ask for money. But supporting The Good Efforts can be a pleasure and a reward for donors. We offer our deep thanks to Kim Klein, our volunteers, and all who attended for another fabulous Confab! To view the presentation slides from the Confab, click here. ©2019 West Marin Fund. All rights reserved.